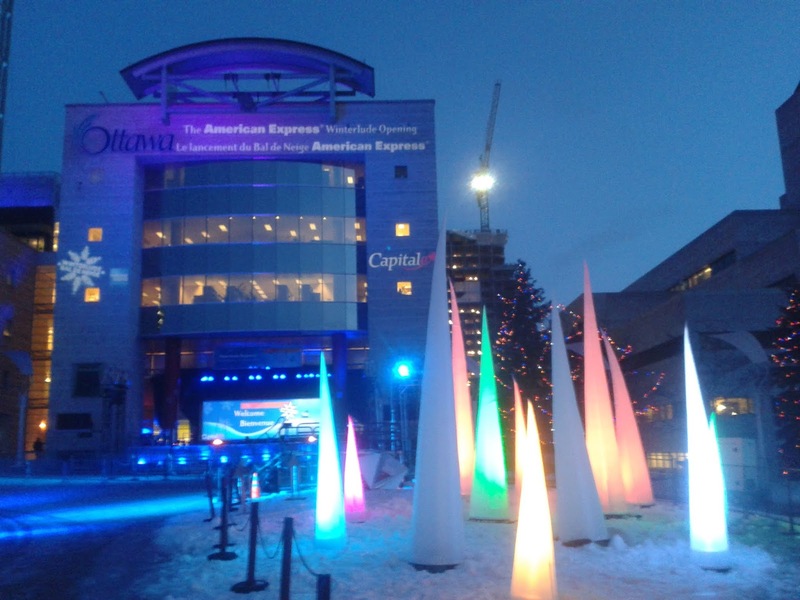 On Friday evening and Saturday my wife and I set out to explore the events of the 2013 edition of Ottawa's Winterlude Festival. We started out on Friday after dinner at Ottawa's City Hall to see set up for the opening ceremonies. 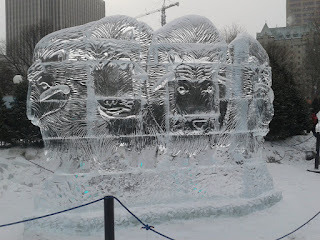 Across the street in Confederation Park the Crystal Garden filled with ice sculptures beckoned. The sculptures around the fountain were complete with lighting being adjusted. 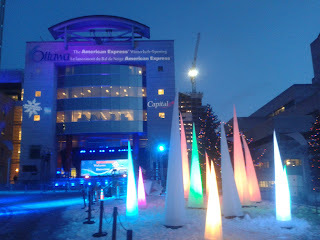 The other larger pieces were being unwrapped after a warm Wednesday and Thursday and lights also adjusted. As well, professional carvers from around the world were starting work on large ice sculptures. 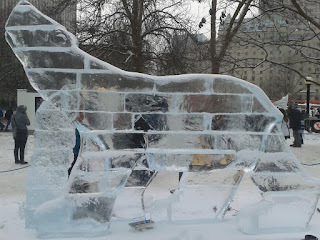 All ice sculptures have to be complete by noon on Sunday ready for judging. 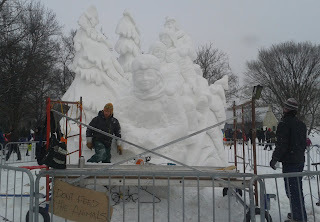 I will return during the week to see the finished larger sculptures because, as expected, the large ice sculptures were croweded with people. On Saturday my wife and I returned for a short walk through of Confederation Park and to take the "Bus-O-Neige" to Jacques Cartier Park in Gatineau Quebec. Jacques Cartier Park's Winterlude Snowflake Kingdom was filled with people, snow sculptures and snow slides! 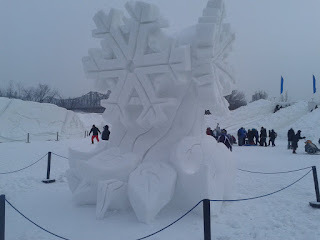 Upon entering Jacques Cartier Park we were greated by a huge snow sculpture. We wandered around the Snowflake Kingdom and watched the lengthy lines at various snow slides. 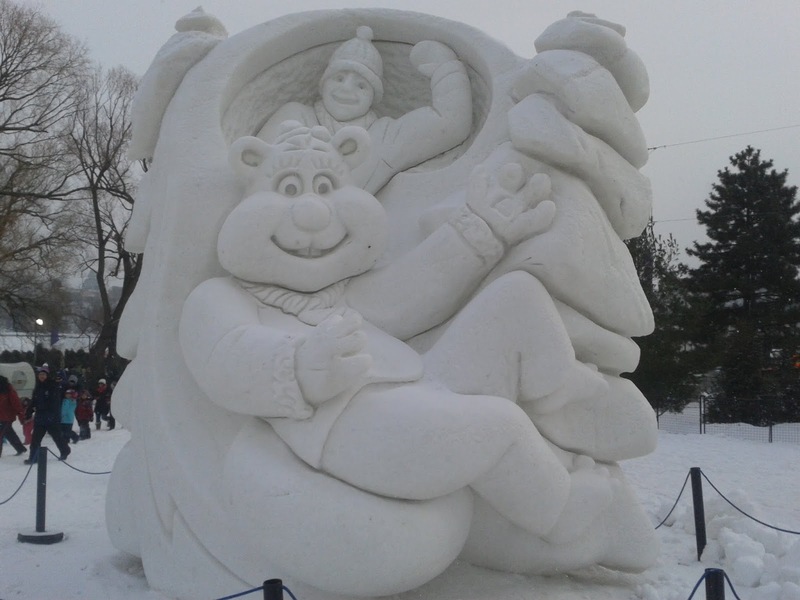 The park was a bustling place filled with snow based activities! We decided to try out a snowslide and waited in line for a group one. Less than five minutes later we were up the top of the snow slide awaiting our turn. Snow slides at Jacques Cartier Park are mounds of snow built up, carved out and flooded with water to make them icey slippery. We tried one group slide where you link arms with someome else. A quarter of the way down I was going to fast and had to let go. I ended up ensuring the crowd watching at the bottom was well enough back as I shot across the bottom of the slide past where the ice stopped. We ventured further around the park to happen upon another snow sculpture near another set of snow slides. We reviewed the military display and the Algonquin First Nations displays then happenned upon a snow sculpture in progress of being carved. One of my favourite views of the National Capital Region is from Jacques Cartier Park overlooking the Ottawa River. 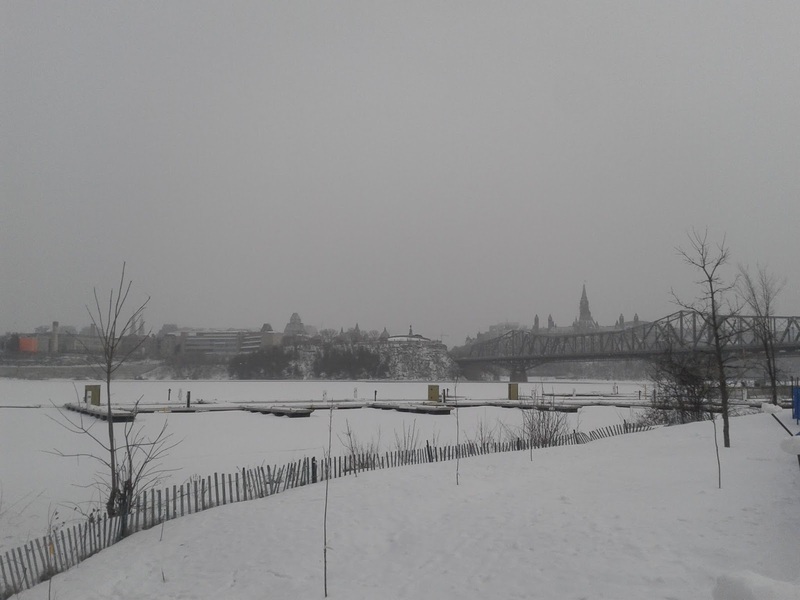 After visiting Jacques Cartier Park we boarded the "Bus-O-Neige" and returned to Ottawa's City Hall. 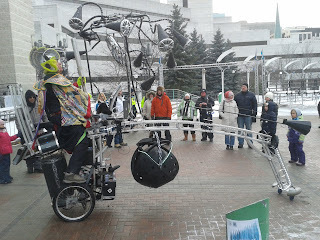 Upon our return a busker had taken to entertain the crowds on his obnoxiously large musical bicycle. 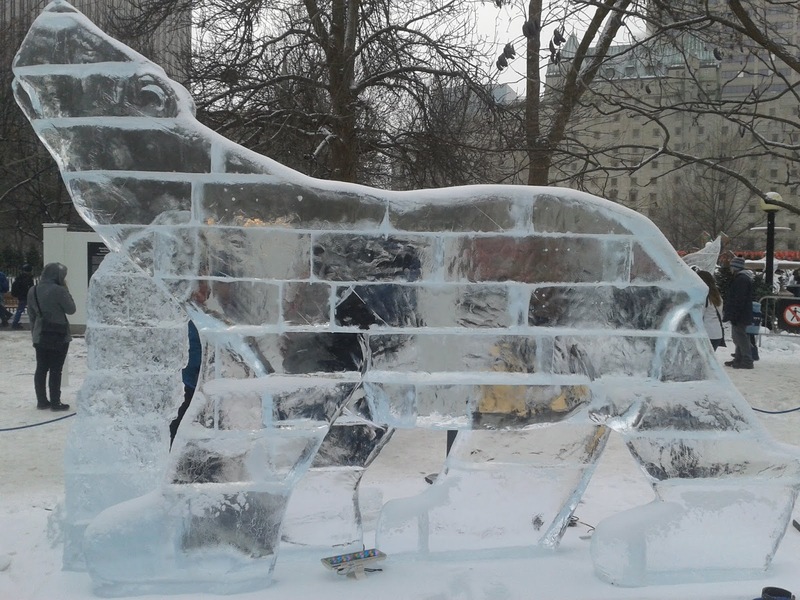 Winterlude is one of the many reasons I've come to love living in Ottawa.